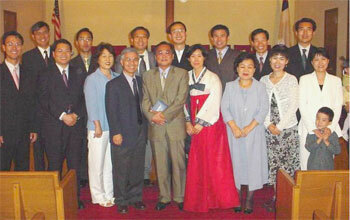 Korean pastors from several states and from Canada helped celebrate the launch of a new Korean church in Findlay. Veterans from the Korean War were treated to an authentic Korean meal. The Forever Love Korean Church, which meets in the First UB church of Findlay, Ohio, held its installation service on Monday, September 27. Korean pastors from California, New Jersey, New York, Indiana, Ontario, and Toronto came to celebrate the new church. Services included a dedication of the new church and installation of new members. The church also invited the Korean War Veterans from Findlay to join in a time of fellowship and an authentic Korean meal. 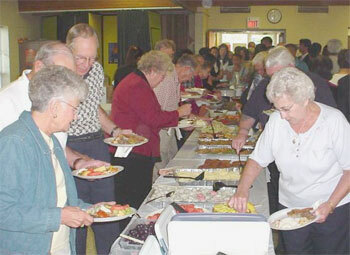 Thirty war veterans from the First UB and the surrounding community came and enjoyed the meal. The Forever Love Korean Church plans to honor veterans again during Veterans Day in November. The Forever Love Korean Church is now in discussion with the denomination on becoming a “preaching point,” which is one step toward becoming a new UB church. Jana sent the following information from Macau on September 22. Last week 25 children came to Kids’ Klub. We’re excited that this many children are attending. A few had learned their memory verses. Praise the Lord for this opportunity to reach children for Christ. More women came back to English Bible Study last Friday. I’m thankful for their friendships and their desire to learn more about the Bible. Pray that new students will feel welcome and accepted as we work to bring them into the group. Pray for a Chinese Christian friend of mine who is facing a lot of negative pressure from her family. Pray for wisdom as I reach out to her. Continue to pray that David and Melissa Kline will be granted work permits so that they can teach in the ELP and at Pui Va Middle School. Former UB missionary Karen Crumbley underwent surgery on Thursday, September 16. The operation went well, though they ended up removing two-thirds of her lung, instead of the one-third they had anticipated. Fortunately, no cancer cells were found. Karen is now doing well. She was moved from Intensive Care to a private room on Sunday night, September 19. If all goes well, she should be able to return home sometime this week. The Hillsdale UB church in Hillsdale, Mich., is celebrating its 100th anniversary. On September 12, they set a new attendance record: 735. The day included the ordination of Worship Pastor Scott Hardaway, the baptism of 15 people, and the reception of 28 new members. The church is averaging two conversions per week this year. Pat Jones, pastor of King Street UB church in Chambersburg, Pa., left on September 14 for a trip to Africa through World Relief. He’ll be visiting several countries. The trip is led by Clive Calver, who has headed World Relief for the past seven years (and is stepping down at the end of September). Further reports from Jamaica, in the wake of Hurricane Ivan, tell of much damage to UB churches and homes. in addition, at least 7 buildings lost their roofs at Jamaica Bible College (where Owen Gordon is the president, and where Bishop Emeritus Wilbur and Mossie Sites are currently serving as volunteers), and there is also much water damage. A fund has been set up for Jamaica Hurricane Relief. You can donate via credit card online, or send a check to: Jamaica Relief, 302 Lake St., Huntington, IN 46750. Make checks payable to “United Brethren Headquarters,” and be sure to indicate whether it is for Jamaica or Florida hurricane relief (since we have funds set up for each). Last week over 20 children attended the first Kids’ Klub. We’d only set up 15 chairs, so God worked beyond our expectations! Praise the Lord for these children who will be learning God’s Word each week. ELP enrollment is much higher than it was last fall. The overall atmosphere is also more upbeat with Michael, David, and Melissa here also building relationships. Praise God for all these people He’s bringing into the center to hear about Him. David and Melissa Kline are still waiting for their permits from the government to be able to teach legally. Continue to pray for that whole situation. Also pray for missionaries with other mission organizations in Macau who are facing similar struggles. This Friday night, Michael will start a Cantonese-speaking Care Group. As with Kids’ Klub, our goal is to start having some activities that are not using English instruction as the main attraction. Pray that people who are spiritually hungry will come. Also pray for wisdom for Michael as he begins this new ministry. Florida Hurricane Relief Fund: $3219 donated. Jamaica Hurricane Relief Fund: $2785 donated. Darlene Burkett, who works in Global Ministries, was able to speak today with Owen Gordon, a UB minister in Jamaica who is also president of Jamaica Bible College. Phone service is back up, but that is all. There is still no electricity and no water. Owen said that they have no idea when those things will get restored because of the extreme damage. Generator. If they had a generator, they would be able to pump water from a holding tank that they have. Right now there are no generators to be found anywhere. They were purchased almost immediately. The government has said that they will not charge duty on any item like this for an extended period of time because of the great need. Chlorine tablets for water purification. These, too, are unable to be obtained in Jamaica. Battery powered lamps and their batteries. This would help, especially at night. The airports are open on a limited basis. Owen isn’t sure what travel from the airports would be like. Most roads are still impassable for the large part. He thinks that individuals familiar with Jamaica might be able to get through.